Like a versatile actor, the BMW 5 Series is capable of playing many roles. It’s a comfortable commuter, a roomy family car, and a capable sports sedan. It offers dynamic performance and handling, and can carry four passengers easily without feeling too cavernous. Changes for 2015 are minor, and include a few new standard features that previously cost extra like Bluetooth audio streaming, a leather sport steering wheel and LED foglights. Luxury and M Sport trim lines continue, the Modern Line is discontinued. The current-generation 5 Series was launched for 2011 and updated for 2014. The BMW 528i is powered by a 2.0-liter turbocharged four-cylinder; the BMW 535i uses a 3.0-liter turbocharged six-cylinder. Line-topping 550i models use a 4.4-liter V8, good for 445 hp, and 480 lb.-ft. of torque. It’s the fastest of the bunch, and BMW says the 550i can speed from 0-60 mph in 4.5 seconds. Perhaps our favorite variant is the diesel-powered 535d, which uses a turbocharged, 3.0-liter six-cylinder engine that makes 255 horsepower and 413 pound-feet of torque. Not only does it get an EPA-rated 26/38 mpg City/Highway, but diesel’s well-known range helped our 535d test car go more than 500 miles on a single tank, and that’s with spirited driving. Although it has a $1,500 price premium over the gasoline-powered 535i, those who travel long distances, especially at highway speeds, could be very satisfied with their return on the money. The odd duck of the bunch is the Gran Turismo, which has more space for people and cargo, but whose high, boxy rear might not appeal to everyone. The GT’s wheelbase is four inches longer than other 5 Series models, with a long hood and a low, coupe-like roofline. The Gran Turismo comes in two versions: the 535i GT with the turbocharged inline-6, and the 550i GT with the V8. Each is available with xDrive all-wheel drive. All 5 Series models come standard with an 8-speed automatic transmission. Inside, materials and quality as are expected from a BMW, whose interior designs are often more interesting, with a variety of textures and colors, than the more austere Audi, yet not as daring as the swoopy, angular lines employed by Cadillac. Navigation comes standard on all models, as well as the iDrive interface, which uses a touchpad on top of the rotary controller that lets users draw letters and numbers with a fingertip, instead of scrolling through characters on the screen. The performance-oriented M5 sedan is equipped with a 560-horsepower V8, available with a 6-speed manual 7-speed dual-clutch transmission with paddle shifters. Although it has the same amount of space as its more practical counterparts, the M5 feels tight and compact on the track, the sign of a well-engineered car. On an autocross course at BMW’s new Performance Center in Thermal, California, near Palm Springs, we turned the fastest lap of the bunch thanks to the M5’s powerful engine and lightning-quick dual-clutch gearbox. While others preferred to manually shift with paddles, we put it in Drive and let it do its thing. In Sport + mode, we had the perfect balance between slip and control, sliding around corners without knocking down cones. Competitors to the 2015 BMW 5 Series are formidable, including the Audi A6, the Cadillac CTS, Lexus GS and Mercedes-Benz E-Class. Those considering the 5 Series Gran Turismo might also consider the elegant Audi A7, with its superior looks and ample cargo space. Although in our book nothing matches the M5 on the track, those interested in a high-powered midsize luxury sedan could also consider the Jaguar XF-R and the Mercedes-Benz E63 AMG. The 2015 BMW 5 Series comes in two body styles: a four-door sedan and a stretched Gran Turismo, or GT. Rear-wheel drive is standard, and all-wheel-drive xDrive versions are available. Five different engines are available. Gran Turismo body styles add four inches to the wheelbase and feature a sleek, coupe-like roof. Models include the 535i GT ($60,700), 535i xDrive GT ($63,000), 550i GT ($69,100) and 550i xDrive GT ($71,400). All 5 Series models can be equipped with Luxury or M Sport lines, each of which feature distinct exterior and interior trim and features. Standard equipment on the BMW 528i includes dual-zone automatic climate control, vinyl upholstery, 10-way power front seats with four-way power lumbar, power tilt-and-telescoping leather-wrapped steering wheel, driver memory function, pushbutton start, cruise control, split-folding rear seats, the iDrive infotainment interface with smartphone app integration, navigation, Bluetooth phone and audio connectivity, a 10-speaker sound system with CD player, HD radio, auxiliary jack and iPod/USB connectivity, power sunroof, automatic wipers, auto-dimming mirrors, heated exterior mirrors, adaptive bi-xenon headlights, LED foglights and 17-inch wheels. BMW 535i and 535d models are equipped similarly, adding leather upholstery and 18-inch alloy wheels to the above features. 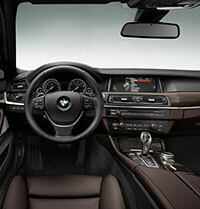 BMW 550i upgrades further with 20-way power front seats with four-way power lumbar, sport steering wheel with paddle shifters (along with a sport-tuned version of the automatic transmission), front and rear parking sensors and a rearview camera. The BMW M5 sedan ($93,600) makes 560 horsepower from its 4.4-liter V8, and comes standard with a choice of 7-speed dual clutch automatic manual gearbox or 6-speed automatic. Standard features include dual-zone automatic climate control, leather upholstery, a power tilt-and-telescoping steering column, 16-way power sport front seats, heated front seats with memory settings, and split-folding rear seats, the iDrive infotainment interface, a navigation, with voice activation, a rearview camera, Bluetooth phone and audio connectivity, a 16-speaker Harman Kardon audio system with a six-CD changer, HD radio, an auxiliary audio jack and iPod/USB connection, power sunroof, driver-adjustable adaptive suspension, adaptive xenon headlights, adaptive cruise control, front and rear parking sensors, auto-dimming mirrors and19-inch alloy wheels with summer performance tires. The M5 Competition Package bumps horsepower up by 15 thanks to a specialized exhaust system and adds a rear M differential, more aggressive steering and suspension tuning, black chrome tailpipes and unique 20-inch wheels. Safety equipment that comes standard on all 2015 5 Series includes front-seat side airbags, side curtain airbags, active front head restraints, stability control, traction control, antilock disc brakes, and the BMW Assist emergency telematics system with a 10-year subscription, which includes automatic crash notification. Optional safety features include the Driver Assistance Plus package, which adds an upgraded camera that shows a full picture of vehicle surroundings, blind-spot warning, a lane-departure warning and forward collision mitigation with pedestrian detection. The optional night-vision system can display possible hazards in the road the driver might not see otherwise. After a mid-cycle refresh last year, the lines of the 2015 BMW 5 Series are more sculptured than in the past, though the design is still unmistakably BMW. The signature twin kidney grille juts out ahead of the wraparound headlights, which are lower profile and more slanted than in past generations. Lower air intakes now house standard round LED foglights, which were previously optional. The 5 Series sedan cabin is set considerably to the rear, giving its profile a slightly wedged, coupe-like forward-thrust shape. A strong, sharply creased character line runs from behind the from wheel arch and into the upper corner of the wraparound tail light housing. The signature Hofmeister kink in the rear side window’s aft edge is, of course, ever-present. Wheel sizes and choices depend on the model; the Luxury and M Sport Lines use their own unique wheels, and other styles can be ordered a la carte. Gran Turismo models are longer and have a curvier, more coupe-like roof shape. Its most noticeable difference from the standard 5 Series is its big, high boxy rear end. The M5 is distinguished by a more aggressive aerodynamic treatment, including wide lower front air intakes, chrome-trimmed side outlets, more flared rocker panels and a decklid spoiler. Quad exhaust tips sit beneath the lower bumper. Standard wheels are 19-inch M-style alloys. The interior of the BMW 5 Series doesn’t disappoint. In typical BMW style, the center stack, gauges and controls are oriented toward the driver. Controls are well placed, with the driver-only functions situated to the left of the steering column or on the wheel itself. Climate controls and ventilation are easy to reach. And unlike some of the less expensive BMWs, trim pieces are well integrated, of quality materials, and don’t look stuck-on like in some configurations of 3 Series and 4 Series. Standard front seats in 5 Series sedans have 10-way power adjustment. Larger adults will feel comfortable in the spacious seats, although those of smaller stature may have a tough time getting comfortable, and could feel like they’re sloshing around on twisty roads. 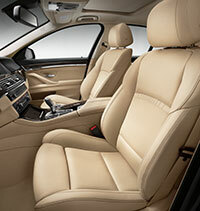 The standard upholstery on 528i models is vinyl, but it looks good and doesn’t appear cheap. The Dakota leather found on more expensive models is nice, though we prefer the optional (yet more expensive) Nappa leather. In sedans and GT models, there isn’t much bolstering to hold you in during hard cornering, even with the optional Sport seats, but that’s nicely taken care of in the M5, which will cradle your every move. Instrumentation includes four classic circular gauges set against a black panel. We think the BMW’s gauges are beautiful. Navigation standard on all models. Paired with BMW’s iDrive interface, the nav is easy to use, once you get the hang of it. With the optional head-up display, navigation guidance can be read on the windshield just above the steering wheel. We especially like the touchpad that sits on top of the iDrive rotaty controller, which allows users to draw letters and numbers instead of scrolling through characters on the display screen. It’s faster and less frustrating. Cargo space in BMW 5 Series sedans is 14.0 cubic feet, slightly less than the Lexus GS and Mercedes Benz E-Class sedan, but more than the Cadillac CTS’s 13.7 cubic feet. All BMW 5 Series sedans are chic, crisp and balanced. Though they are perhaps too big and heavy to use as a weekend track car, their excellent dynamics and agility make them assertively proactive and manageable when faced with the necessity of an emergency avoidance maneuver, making them excellent family sedans. The BMW 528i, 535i and 550i models are all highly competent and balanced, with exceptional poise and pace. Though BMW touts all its cars as having near-50/50 weight distribution, there is some wiggle room between the models. The BMW 550i, with its V8 engine, is the most nose-heavy, with a 52.5/47.5 percent front-rear weight distribution; the 535i with its I6 comes in at 50.9/49.1 percent; and the 528i scores 49.4/50.6 percent with its lighter engine. So it’s no surprise that the 528i handles the best. The others make up for the difference with more power. We found the BMW 535i and 550i to be controllable at high levels of acceleration, stopping and cornering on the racetrack. But the BMW 528i displayed exemplary quickness and agility, which was also noticeable on the street. Optional adaptive suspension improves handling further, as it constantly manages ride and handling based on the current road surfaces. The 535d is powerful, smooth and capable. As expected from a diesel engine, it provides plenty of low-end thrust. We took our 535d on a road trip from Los Angeles to Palm Springs, and tackled the hills between the Inland Empire and the desert with ease, passing scores of other vehicles slogging up the steep inclines. Compared to old diesel vehicles, noise and vibration from the 535i is much reduced, though we did notice its distinctive rumble around town at low speeds, and recognized its unmistakable sound from around the block when it was delivered by the valet. Another advantage to the 535d is its marvelous range. We got about 500 miles on a single tank, and that was mostly while driving with a heavy foot in Sport mode. EPA fuel economy estimates for the 2015 BMW 535d rear-wheel-drive model are 26/38 mpg City/Highway and 30 mpg Combined. During our excursion, our mileage, according to the trip computer, ranged from 27 mpg to 31 mpg, averaging 30.0 mpg for our 500-mile trek. All 5 Series models, with the exception of the M5, use an 8-speed automatic transmission. Shifts are smooth and comfortable, and hold higher revs in Sport mode for more spirited driving. The two highest gears are considered overdrive, so cruising in high gear in Comfort or EcoPlus mode on the freeway can help with fuel economy. Steering on the 5 Series cars is electronic and uses variable ratio tuning, which makes it comfortable and stable on highways and straightaways, yet more precise and responsive around corners and for low-speed maneuvering. Like most BMWs, the 5 Series use BMW’s automatic Stop/Start technology, which stops the engine when the car is not in motion to conserve fuel, and starts the engine again when the driver takes her foot off the brake. While earlier versions of the system were abrupt and uncomfortable, we find the system has improved, even though it’s still noticeable. The M5 is totally different than the other 5 Series models. It starts with a twin-turbo 4.4-liter V8 engine tuned for a hearty 560 hp and 500 lb.-ft. of torque available over an amazingly wide power band, from 1500 to 5750 rpm. It can go from 0 to 60 in 4.2 seconds, with an electronically limited top speed of 155 mph. Electronically controlled dampers, M-specific Servotronic steering, a stability control system with M Dynamic Mode, active limited-slip differential, high-performance compound brakes, suspension structure and sub-frame mods, and more. Transmission choices include a 7-speed, dual-clutch automated manual or a traditional 6-speed manual gearbox. While old-school purists swear by the stick shift, BMW’s dual-clutch box is not only faster, but more fuel-efficient. Although it has the same amount of space as its more practical counterparts, the M5 feels tight and compact on the track, the sign of a well-engineered car. On an autocross course at BMW’s new Performance Center in Thermal, CA (near Palm Springs), we turned the fastest lap of the bunch thanks to the M5’s powerful engine and lightning-quick 7-speed, dual-clutch gearbox. While others preferred to manually shift with paddles, we put it in Drive and let it do its thing. In Sport + mode, we had the perfect balance between slip and control, sliding around corners without knocking down cones. 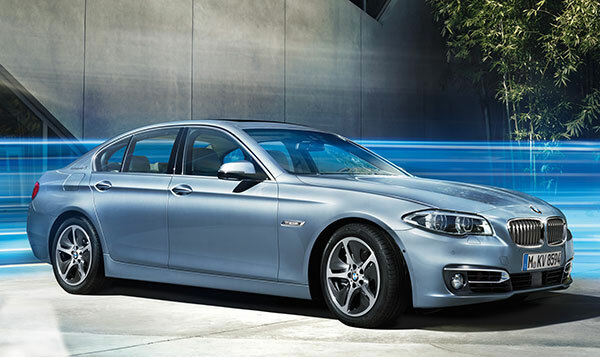 The 2015 BMW 5 Series remains one of the best midsize luxury sedans on the market. The diesel-powered BMW 535d offers maximum range, while the odd but practical GT offers the most passenger and cargo space. The M5 serves up power and track-ready handling. Laura Burstein and Sam Moses contributed to this NewCarTestDrive.com report. Head/hip/leg room, f: 40.5/NA/41.4 in. Head/hip/leg room, r: 38.3/NA/36.1 in.